The Estadi Municipal Olímpic is a stadium in Terrassa, Catalonia, Spain. 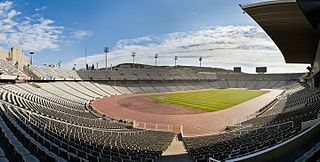 It is currently used for football matches and is the home stadium of Terrassa FC. The stadium holds 11,500 spectators. The venue hosted the field hockey competitions for the 1992 Summer Olympics. Built in 1955, it was renovated in 1991 for those games. It was also used in a friendly match between the Catalonia national football team and Costa Rica on May 24, 2006, in which Catalonia won 2-0. 1992 Summer Olympics official report. Volume 2. pp. 298–302. Terrassa is a city in the east central region of Catalonia, in the province of Barcelona, comarca of Vallès Occidental, of which it is the cocapital along with Sabadell. Estadi Olímpic Lluís Companys is a stadium in Barcelona, Catalonia, Spain. Originally built in 1927 for the 1929 International Exposition in the city, it was renovated in 1989 to be the main stadium for the 1992 Summer Olympics. The Olympic Stadium is the main stadium for the 1928 Summer Olympics in Amsterdam. The venue is currently used mostly for football, athletics and music events. The Vélodrome de Vincennes is a cycling stadium in the Bois de Vincennes, Paris, France. Dinamo National Olympic Stadium is a multi-purpose stadium in Minsk, Belarus. It was recently reopened after a massive renovation project. Earlier it was used mostly for football matches and was the home ground of Dinamo Minsk, FC Minsk and the Belarus national football team. Previously the stadium officially held 40,000, but because part of the upper stand had been abandoned in the mid-1990s for safety reasons, the actual capacity before renovations was only 34,000. After renovation the capacity is 22,246. Rosenaustadion is a multi-purpose stadium in Augsburg, Bavaria, Germany. It is the second largest stadium in the city. The Shanghai Stadium is a multi-purpose stadium in Shanghai. It is currently used mostly for football matches of Chinese Super League side Shanghai International Port Group FC. Palau d'Esports de Granollers is an arena in Granollers, Catalonia. It is primarily used for team handball and is the home arena of BM Granollers. The arena, projected by the Catalan architect Pep Bonet, holds 5,685 people and was opened in 1991 for the 1992 Summer Olympics. During those games, it hosted the handball competitions. It is managed by the city of Granollers. Kalamaria Stadium is a multi-purpose stadium in Kalamaria, a district of Thessaloniki, in Greece. 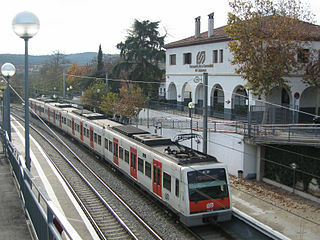 The Barcelona–Vallès Line is an unconnected standard gauge railway line linking Barcelona with Sabadell and Terrassa via the Collserola mountain range, in Catalonia, Spain. Its name refers to the Catalan historical region of Vallès, whereby most part of the line runs. Plaça de Catalunya station serves as the Barcelona terminus of the line, where almost all its trains either start or terminate. The line then continues northwards and branches off twice before leaving the city limits. Its main route splits in two in Sant Cugat del Vallès, forming two major branches to Sabadell and Terrassa. It has 40 passenger stations in operation and a total line length of 48.1 kilometres (29.9 mi). Sport has an important incidence in Catalan life since the beginning of the 20th century. The main sports in Catalonia are football, basketball, handball, rink hockey, tennis and motorsport. The Poststadion is a multi-use stadium in the Moabit district of Berlin, Germany, built in 1929 for the sports club of the German Reichspost at the site of a former Prussian Uhlan parade ground. It is adjacent to the Fritz-Schloss-Park. Together with the Fritz Castle Park, the facility is also known as SportPark Poststadion. The complex is one of the largest sports facilities in Berlin and is currently managed by the Berlin burough of Mitte. A designated landmark since 1990, its stands and terrace are currently under reconstruction. The original structure of the main entrance in the Lehrter Strasse conserves its earlier architecture with its rows of ticket booths lining the entrance.